Eve Appel, the amateur sleuth whose adventures solving mysteries in rural Florida have been told in two full-length novels, A Secondhand Murder and Dead in the Water, is featured in three short stories available as Kindle Singles only ($.99/each). The third novel-length cozy mystery in the series, A Sporting Murder, will be released on July 15, 2015. 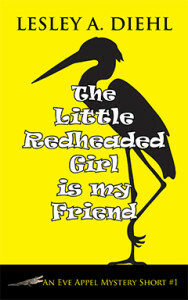 “The Little Redheaded Girl is my Friend” introduces Eve and Madeline as children, teenagers, and finally young adults. 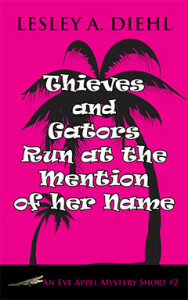 “Thieves and Gators Run at the Mention of her Name” tells the story of Eve’s arrival in Sabal Bay, and “Gator Aid” finds Eve and Madeline at a writers’ conference. In each story, the two women stumble onto a mystery. 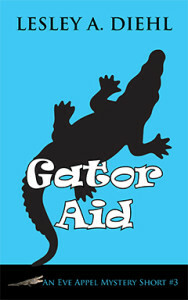 A version of “Gator Aid” won the 2009 Sleuthfest Short Story Contest, sponsored by Mystery Writers of America, Florida Chapter. Lesley has published five other full-length mysteries: A Deadly Draught, Poisoned Pairings, Dumpster Dying, Angel Sleuth, and Grilled, Chilled, and Killed. Eve Appel was an original long before she bought her clothing consignment store in rural Florida. After her parents are killed in a boating accident, she goes to live with her grandmother, “Grandy,” in Connecticut. Already a trendsetter, Eve is also taller and braver than most of her grade school classmates. It isn’t long before she meets the girl who will become her best friend—Madeleine. Petite and redheaded, Madeleine is clumsy but no pushover. Together they foil bullying students, bigoted teachers, and when they reach high school, the class lech. While still in college, Madeleine and Eve seize the chance to tackle their first mystery. Their neighborhood drugstore is the target of a shoplifter, and naturally the local young people are suspect. That means they and their friends can’t shop there anymore without security dogging their every step. After solving the case and settling an old score at the same time, Madeleine and Eve are left with a serious taste for sleuthing. Fed up with her cheating husband, Eve Appel decides to leave her home in Connecticut and join her friend Madeleine in Sabal Bay, Florida, as a partner in a consignment shop. But Eve is not prepared for rural Florida, with gators constantly underfoot, scrubby palm trees, and swamp and prairie as far as the eye can see. No sooner have they unlocked their new storefront when someone tries to break in. What is the thief after, they wonder, when all that’s in the store are naked mannequins and dress racks? As usual, Eve is ready to tackle the mystery head-on, with Madeleine dragged reluctantly behind. Eve Appel and her best friend Madeleine run a consignment shop together in rural Florida. Madeleine is also an author, and now she wants to switch from writing children’s books to mystery novels. So she drags Eve to a writers’ conference, hoping her friend will bolster her confidence during her big pitch to an agent. It soon looks as if Eve isn’t going to make that appointment. A case of mistaken identity results in her agreeing to pose as the person she has been mistaken for. It doesn’t hurt that the special agent assigned to the case is a hunk. When his plan to keep her from harm goes awry, Eve finds herself in the trunk of a car, en route to the swamps, where the hungry alligators await their dinner. Hair still wet and wearing the over-sized terrycloth robe, Madeleine stood behind me as I pounded on the door of 748. “Who is it?” asked a male voice. Ah well. I shrugged. We’d done what we could do, so I slid it under the door. Now we’d just have to stake out 748. Before I could let Madeleine know my plan, the door flew open and a tall man dressed in dark slacks and white shirt grabbed both of us and pulled us into the room. “Who are you? Drago send you with this? Kind of short notice, don’t you think?” He held up the note. So I did. I told him about the misdelivered note, my voice shaky, my hands tingling with fear and curiosity. I told the story again. On the third telling, the phone rang. “Damn. Answer that,” he said. He hung up. I handed the phone back to Mr. Armed and Hunky. “I believe that may have been your Drago person,” I said. I stood and jerked Madeleine off the bed. “Look, I was trying to help out someone in trouble. My mistake. You’re more equipped to handle this than we are. Goodbye.” I expected him to grab us and throw us back onto the bed. Under other circumstances, I might have welcomed a toss on the mattress with a guy as yummy as he was, but I’m not crazy about the combination of guns and strange men in hotel rooms. Besides, I was still sweaty from seven floors of stair climbing, which is way harder than the Stairmaster.